God once declared everything in the world "very good." It's when families are healed. It's when churches, schools, and public policies protect human dignity. Shalom is our calling as followers of Jesus's gospel. It is the vision God set forth in the Garden and the restoration God desires for every relationship. What can we do to bring shalom to our nations, our communities, and our souls? Through a careful exploration of biblical text, particularly the first three chapters of Genesis, Lisa Sharon Harper shows us what "very good" can look like today, even after the Fall. Because despite our anxious minds, despite division and threats of violence, God's vision remains: Wholeness for a hurting world. Peace for a fearful soul. Shalom. 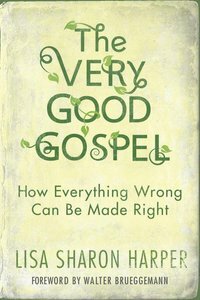 About "The Very Good Gospel"